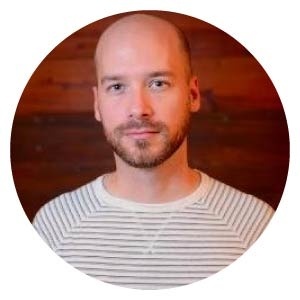 A well-placed testimonial can transform landing page conversion rates, create credibility and trust, and persuade would-be customers to take the leap. It's no wonder social proof has a direct impact on sales revenue. But social proof is notoriously hard to come by, and it seems to be harder than ever to persuade customers to share their testimonials. Thankfully, I have a solution. 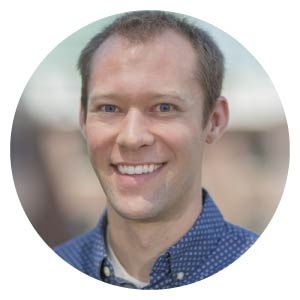 Today, I'm walking through a 7-step method for collecting powerful social proof, using nothing more than a free survey tool. Customers. This survey works best when it's emailed to engaged, active customers (even a handful will work). Survey tool. All the examples shared in this post are from JotForm. It's free to sign-up & get started, and the most intuitive form builder I've found to date. This tutorial should help you to achieve the same in other tools (like Survey Monkey or Google Forms), but there may be extra steps required. Incentive. Social proof is valuable, so you need to offer something valuable in return. Incentivise completion of the survey by offering a free package upgrade, a discount code, or even access to a new beta product. This link. 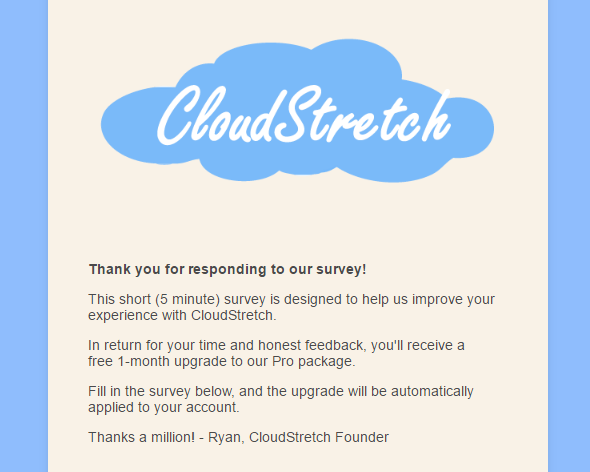 Click the link to view the actual survey I made during this tutorial (designed for a fictitious SaaS company called CloudStretch). In a handful of sentences, your introduction should explain what the survey is trying to achieve, and what reward your customer can expect in return. So whether you’re soliciting feedback via a website page, an email, or some other means, you'll want to emphasize why it’s worthwhile for someone to weigh in. Specifically, what will your organization do with the information your respondents provide? Why should your respondents care about that? How will your respondents benefit from sharing their perspectives? 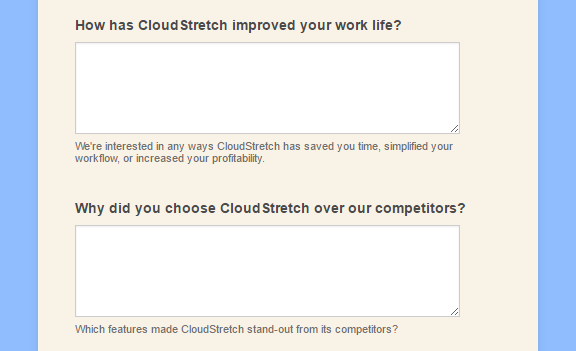 Next up, I used a "Scale Rating" form element to create a simple 10-point scale, posing the question "How likely are you to recommend CloudStretch to a friend or colleague?". The Net Promoter Score (or NPS) is valuable in its own right, allowing us to quantify customer happiness over time. 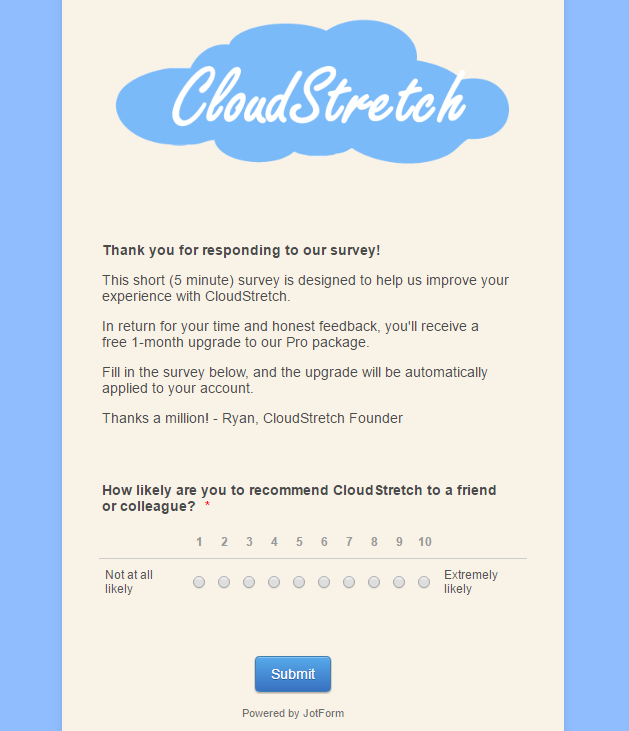 But by opening our survey with an NPS, we're also increasing our chances of getting powerful social proof. There's something in psychology called the "commitment and consistency" principle: people are more likely to do something if they've already committed to it. In our case, this means that responding positively to the NPS will make people more likely to provide a great testimonial: they've just committed to recommending your product to others, and they'll want to be consistent with that decision by providing a testimonial. Benefits to time, productivity and profitability. Advantages over other potential solutions. Most survey tools (including JotForm) have some form of "Sub-Label" option, which is great for providing explicit guidance about the type of feedback you're looking for. The more guidance you can provide, the better the feedback (and social proof) will be. The above fields are great for satisfied customers, but what happens if we get a negative response to our NPS? Will they want to talk about the product's benefits? The form is getting pretty long, and presenting someone with a dozen form fields is a fast-track towards form abandonment. For example, any "detractors" from our Net Promoter Score (those that score lower than 7) are unlikely to share positive testimonials - we might even annoy them by asking. So if the NPS selected is lower than 7, we can use conditional logic to show them the "How can we improve?" field. If the score is greater than 6, we can show the feedback forms instead. "By ticking "Yes", you'll allow us to help other customers by sharing your experiences on our website." This uses another principle of psychology: automatic compliance. Whenever a request is followed by a reason (even a bad reason), the chances of someone agreeing to the request increase dramatically. I've also reduced friction by selecting "Yes" as the default option, and making it a required field. If a customer wants to say "No", it has to be a conscious decision. If you're sending the survey out to existing customers, you'll already have access to their name, company and even job title. But you're still missing the most crucial part of social proof: the photograph. Testimonials with photos were significantly more effective (p-value = 0.0035) at generating viewer recall than testimonials with no photos. When it comes to recognizing variants among treatments, photos are memorable, logos and numbers are not. Photos are even more valuable than feedback, so you'll probably need to offer an additional incentive. Adding this into the survey could reduce the overall submission rate. This introduces a trade-off: do you want as much social proof as you can get? Or are you after the best quality social proof possible? For a happy medium, make the photo an optional part of the survey. This strategy is incredibly effective at generating social proof, but it's reliant on one thing: happy customers. There are no substitutes for a great product, but if you're willing to spend time helping your customers, they'll be willing to spend time helping you.